If you told me a year ago that I would crochet this blanket in under 2 months, I would not have believed it. But here it is! The better news is that if I could do it, you could do it. I guess the most important thing is to learn to crochet. 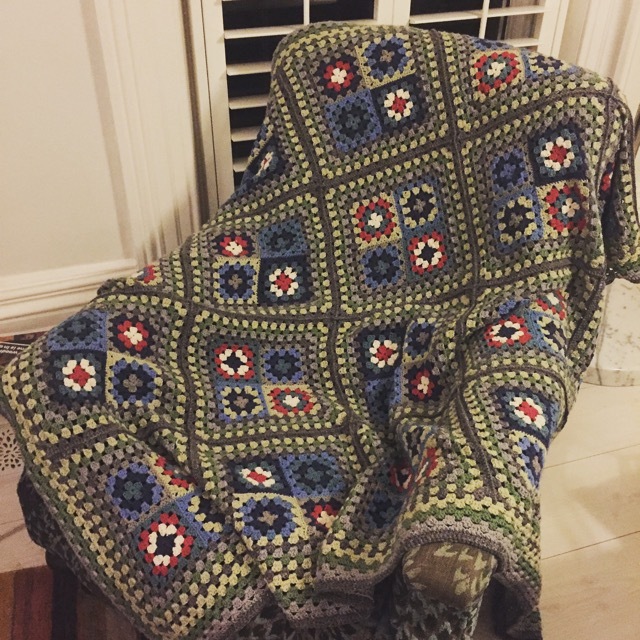 I still feel like I can barely crochet even know, and I certainly didn’t know how to read a pattern. But the good news is – there are fantastic resources available on the internet. 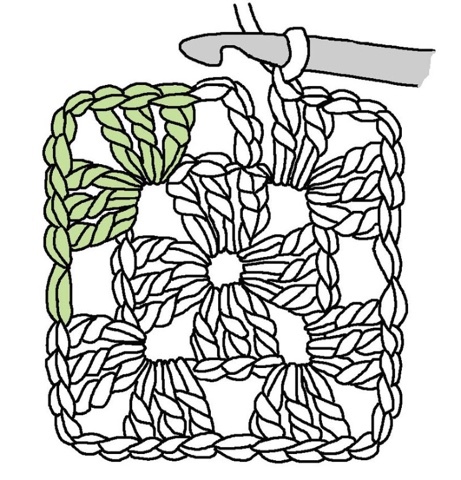 YouTube is great, I used an online crochet tutorial to get me started – there are a few, but this one will give you an idea. I am a very visual learner and I like to ‘see’ the patterns, so I found some of these instructions on Pinterest, and drew some out for myself on a scrap of paper. It just made it easier to visualise what I needed to do. 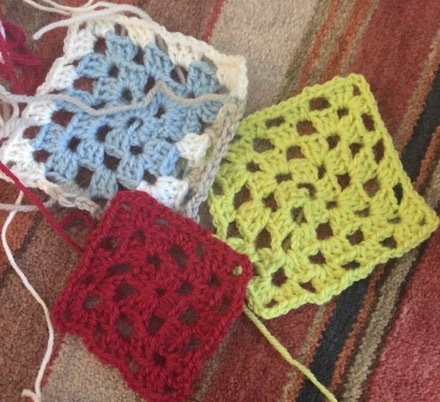 Don’t worry if your first squares look a little odd or lopsided. Here are my first ones – as you can see, I still needed a lot of practice! But eventually I felt ready. I had to learn how to change colours, how to work away the ends, and decide on the final pattern I was going to use. At first it was very slow going. I am a knitter, so I was becoming increasingly frustrated by my own slowness. And my fingers just wouldn’t cooperate. I couldn’t hold the square and the wool (I know I should call it ‘yarn’, but it is always ‘wool’ to me!) simultaneously. Eventually I gave in, which means I don’t hold everything the ‘right’ way, but it works for me, so that’s ok. 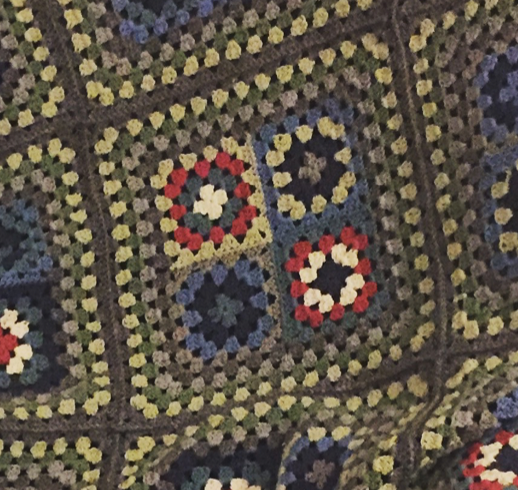 The one thing I realised from pouring over images from various sources: Google Images, Pinterest and Blogs from crochet gurus, is that you may be able to crochet better than anyone else, but if you can’t choose colours that look good together, your project won’t be as fantastic as you hoped! Colours are incredibly important in the end result. And I realised, my technique might not yet be great, but I will use colours to help it look good. I was so proud of my first squares. I was still taking forever, making many mistakes, but I could also feel that I was slowly improving. Because the bottom line is – it is really quite easy once you know how to get going on the basics. I became a bit quicker as I practised. I could get a better sense of how the colours were working together – and it seemed like it all worked. I was now ready to try and sew a few of these together to create the bigger blocks I wanted to make. I tested the border with a few different colours, and they seemed to work together quite well. Once I had done a few, I could get a sense of what the big blocks would look like together. By this time, I could crochet much quicker. I tried to use all ‘dead time’ to crochet: when I am a passenger in a car, when I am on a long phone call, watching TV etc. But the next big decision was: how big to make it? I am not the most patient of people, so I was looking forward to it being finished. If you’re working from a specific pattern, you’re obviously not going to have this issue – but I had to make some decisions. Easiest was to lay out all the different options on the floor in the lounge. And that is when I decided to make it bigger. It meant exponentially more crocheting, but I thought it would have a better impact and be more useful. 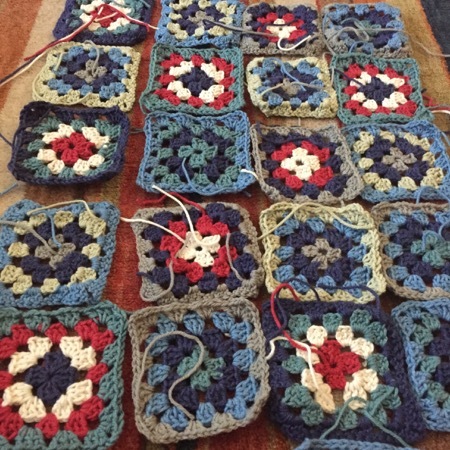 So I got back to it and added more and more small granny squares, which then became bigger squares. I would need 20 big squares. I think each big square would take approx 3-4 hours in total to create. (Remember, I am still a beginner!). This means it’s quite an investment time-wise. It’s not cheap, so plan it! 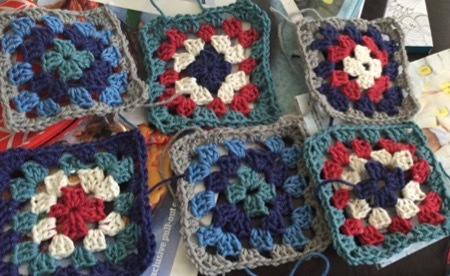 Crocheting is not a cheap hobby – especially not in the UK. I chose to use very good quality wool/yarn: Rowan Wool Cotton. To give you an idea, each 50g ball cost approx £5-£6 (R100-R125) and I must have used about 20 balls. (Next time I am going to count!) Of course, if I was crocheting something ‘fashionable’, I wouldn’t spend so much on wool. But I was crocheting something that I hoped for last forever, so I wanted to use really good wool. I have however found a way to keep down the cost: I have ordered a big batch of wool from I Love Yarn online store in South Africa and they ship it to me in the UK for me. Only takes a few days and is MUCH cheaper. You do have to buy in a big batch to make it worth while, but the cost could come down to about £2 (R40) per 50g ball for 100% cotton yarn. 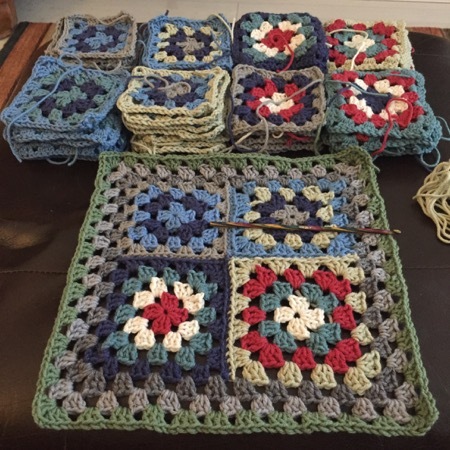 My sister encouraged me to crochet the blocks together before adding the final borders (which takes forever, by the way!). I thought it might be to difficult to do, but YouTube to the rescue again, and I found it quite easy in the end. It does form a ridge, but as long as you do it on the wrong side, no-one will even notice – you can only just see them on this picture below. Of course, you could include the ridges as a feature of the pattern too. Finally, I had to add a border. My friend Kari, who inspired me to take up crocheting in the first place, suggested a bobble border, which I am sure would have looked great … but unfortunately I didn’t have enough wool in the end, and I was too lazy to drive to the shop 30 mins away to buy more. So I stuck with this simple border – but in hindsight, I think it works very well. Mission accomplished! And I love it.